Step 1 In a large saucepan heated over medium heat, melt the butter. Stir in the onion, celery and apple and reduce the heat to low. Cook, stirring occasionally, until the contents are soft and slightly golden, about 10 minutes. Step 2 Sprinkle the flour over and stir to coat the contents. Continue to cook, stirring constantly, for 3 minutes to moisten the flour. Step 3Whisk in 1 cup of the chicken broth. Increase the heat to medium and continue to whisk until the broth has thickened and begins to bubble, about 3 minutes. Whisk in the remaining broth and bring the contents to a brisk boil, stirring frequently. Reduce the heat to a gentle simmer, cover the saucepan and simmer for 15 minutes. Remove from heat and puree the soup in a blender or with an immersion blender. Strain the puree into a clean saucepan. The soup can be made up to this point and chilled; reheat the puree over low heat before serving. Step 4Heat the puree over medium-low heat and stir in the Brie cubes. Cook, stirring occasionally, until the cheese is fully melted, then whisk until the soup is completely smooth. Whisk in the heavy cream and thyme, and season to taste with salt and pepper and optional brown sugar. Step 5Garnish the soup with parsley before serving. This makes about 1 quart soup. 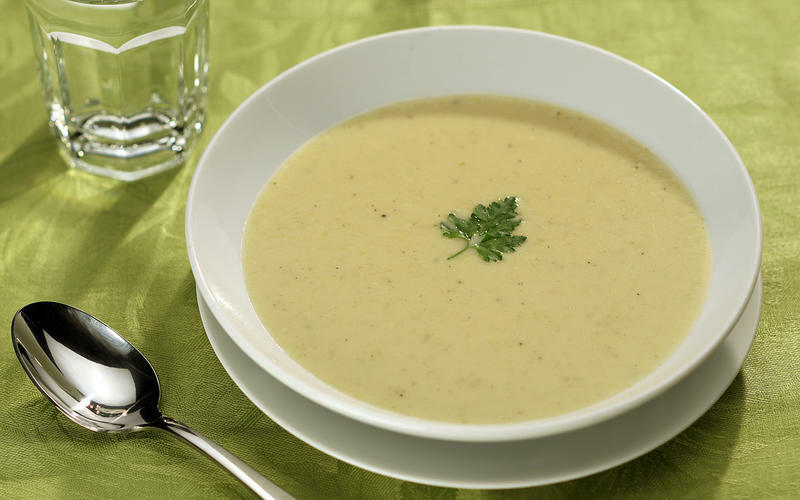 In Recipes-list.com we have selected the most viewed recipes from category - Main courses Soups . Enjoy the best recipes specially selected for you! Brie 'n' apple soup is the right choice that will satisfy all your claims.